Arctium minus (Hill ) Bernh. Also Called: Common burdock, lesser burdock. Stems: Erect, branched, minutely pubescent. Leaves: Basal and cauline, alternate; petiole present; blade cordate to ovate, 12 to 24 inches long, 6 to 14 inches wide, base acuminate or sagittate, margins entire to undulate or coarsely toothed, apex obtuse to acute, surfaces sparsely to densely tomentose. Inflorescences: Heads discoid, in raceme-like or panicle-like arrays; involucres spherical, .6 to 1.6 inch; phyllaries many, in 9-17 series, narrowly lanceolate to linear, margins entire, apex long-attenuate and hooked, at least on outer phyllaries; receptacles flat, not pitted, minutely bristly. Flowers: Florets 25-40, bisexual, fertile; corolla purple to pink or white, .28 to .5 inch. Fruits: Achenes dark brown, obovoid, .2 to .28 inch, glabrous; pappus of white barbellate bristles .04 to .1 inch. Distribution: Principally east half of Kansas, but scattered in northwest quarter. 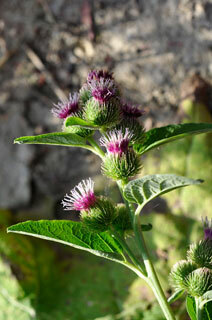 Uses: The root of burdock was used medicinally by the ancient Greeks and during Medieval times. Native Americans applied a poultice of the leaves to boils and rheumatism and boiled its root and took the tea as a remedy for pleurisy. Comments: Plants not spiny. As the achenes ripen, the hooked phyllaries of the involucre become rigid and can catch on clothing or in the hair of animals and are pulled off and carried away, scattering the achenes. Arctium bear, alluding to the roughness of the involucre and minus, smaller.